The Hilden Grange run is a great little starter for pupils new to cross country competition. Fast, flat and fairly short (less than 1km), it is friendly and low-key and, on a glorious February afternoon, was a perfect introduction for those Saint Ronan's pupils who were donning the blue-hooped vests for the first time. Of course, the athletes shot off at the start as if they were doing an 80m sprint; little legs struggling to keep up the momentum for 900m. However, the team gave it their all and responded well to the cheers of the supporting crowd as they entered the finishing lap. Leading the team home was Freddie F in eighth place, with Josh L just behind in eleventh. Next home was James M (20th); Alfie A (46th) completing the four-to-score team which finished fourth of eleven. In his first race for the school, Woody C looked strong (49th) and Jonny A surprised himself and his father by competing for the first time, running all the way and finishing full of enthusiasm in 60th! 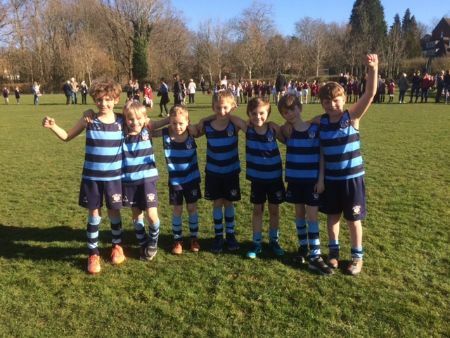 Edward S, an U8, ran for the U9 team - see report!